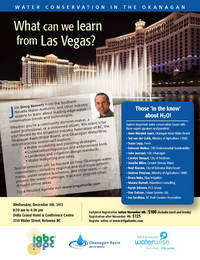 Home › Workshops › Water Conservation in the Okanagan: What Can We Learn From Las Vegas? Water Conservation in the Okanagan: What Can We Learn From Las Vegas? The Water Board, along with its Okanagan WaterWise program, teamed up with the Irrigation Industry Association of BC to present a special day-long workshop in Kelowna on Dec. 5, looking at what water conservation lessons the Okanagan can learn from Las Vegas. The event featured Doug Bennett from the Southern Nevada Water Authority and many other water experts. The event was geared to those working in irrigation, landscaping and other water-related businesses, those who make and implement water conservation policy (e.g. local government electeds and staff), as well as interested members of the public. Standards for Landscape Irrigation Systems – Ted van der Gulik, Irrigation Industry Association of B.C.